A recent study of the economic impact of Ohio’s 14 four-year public universities provides a compelling case for maintaining a strong system of public higher education in our state. 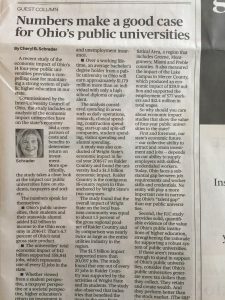 Commissioned by the Inter-University Council of Ohio, the study includes an analysis of the economic impact universities have on the state’s economy and a comparison of costs and benefits to determine return on investment. More specifically, the study takes a close look at the impact our public universities have on students, taxpayers and society. Ohio’s public universities, their students and their statewide alumni added $42 billion in income to the Ohio economy in 2016-17. That’s 6.7 percent of Ohio’s total gross state product. The universities’ total economic impact of $42 billion supported 558,841 jobs, which represents one of every 12 jobs in the state. Whether viewed from a student perspective, a taxpayer perspective or a societal perspective, higher education’s return on investment is solid. For example, students at Ohio’s public universities realize a 13.7 percent annual return on their investment. That’s $4.60 in future earnings for every $1 students spend on tuition, supplies and opportunity costs. Ohio taxpayers realize an 8.6 percent annual return on their investment in public universities — with the benefit coming in the form of future tax revenue and government savings resulting from reducing costs incurred by the state to pay for health care, criminal justice programs and unemployment insurance. Over a working lifetime, an average bachelor’s degree holder from a public university in Ohio will earn approximately $1,179,000 more than an individual with only a high school diploma or equivalent. 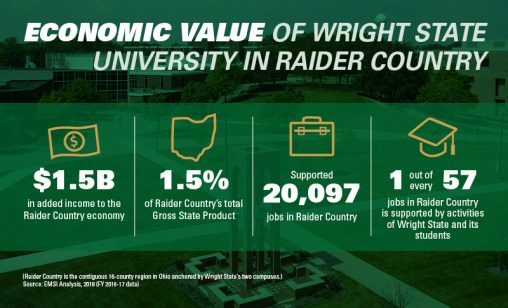 A study was also conducted of Wright State’s economic impact in FY2016-17 on Raider Country and found the university had a $1.5B economic impact. Raider Country is the contiguous 16-county region in Ohio anchored by Wright State’s two campuses. 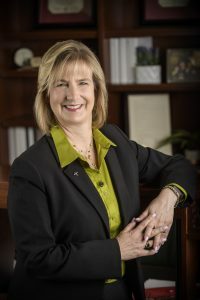 The study found that the overall impact of Wright State on the local business community was equal to about 1.5% of the gross regional product of Raider Country and by comparison was nearly twice as large as the entire utilities industry in the region. The $1.5B impact supported over 20,097 jobs. The study found that one out of every 57 jobs in Raider Country was supported by the activities of Wright State and its students. The study also observed that industries that benefited the most in the area from Wright State’s impact were manufacturing, health care and social assistance, government non-educational, and finance and insurance. Earlier this year, a separate economic impact study commissioned by the Southwestern Ohio Council for Higher Education (SOCHE) found that Wright State in FY2015-16 had more than a $1 billion annual economic impact on the Dayton region and supported 14,700 jobs. The SOCHE study measured the impact of Wright State’s Dayton Campus in the Dayton Metropolitan Statistical Area, a region that includes Greene, Montgomery, Miami and Preble counties. It also measured the impact of the Lake Campus in Mercer County, which produced an economic impact of $39.9 million and supported the employment of 577 workers and $12.4 million in total wages. So why should you care about economic impact studies that show the value of Wright State or other four-year public universities to the state? Guest column printed in the Dayton Daily News Friday, June 15, on page A13. First and foremost, our state’s economic future — our collective ability to attract and retain investment and jobs — depends on our ability to supply employers with skilled, credentialed workers. Today, Ohio faces a substantial gap between job requirements and worker skills and credentials. No entity will play a more important role in narrowing Ohio’s “talent gap” than our public universities. Second, the IUC study provides solid, quantifiable evidence of the value of Ohio’s public institutions of higher education, strengthening the rationale for supporting a robust system of public universities. College-level learning is key to economic opportunity, competitive advantage and economic prosperity — for individuals, businesses and the state. Public universities drive economic activity, create economic opportunity and are a great long-term investment for students and the state. In other words, higher education delivers in a big way. Add up the numbers. I think you’ll agree. Guest column printed in the Dayton Daily News Friday, June 15 on page A13.